Is It Time for Your Kids to Have An Eye Exam in Lakeville? Eye exams for children are extremely important. Experts say 5 to 10% of pre-schoolers and 25% of school-aged children have vision problems. Early identification of a child's vision problem is crucial because, if left untreated, some childhood vision problems can cause permanent vision loss. Some of the common eye conditions we treat at Lakeville Family Eye Care. For school-aged children, the AOA recommends an eye exam every year if no vision correction is required. Children who need eyeglasses or contact lenses should be examined annually or according to their eye doctor's recommendations. Experts say that 80% of what your child learns in school is presented visually. Undetected vision problems can put them at a significant disadvantage. 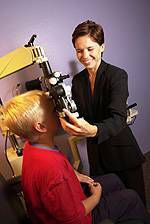 Be sure to schedule a complete eye exam at Lakeville Family Eye Care for your child prior to the start of school. For more information about Pediatric Eye Exams or any other eye care service we offer, check our Patient FAQs or call your Lakeville, Prior Lake, and Farmington eye doctor!